Subject: Congratulations! You Have Won A Million Euro(|1,000,000)... ContactYour Claims Agent. Congratulations! You Have Won A Million Euro(|1,000,000)... ContactYour Claims Agent. computer ballot search from the internet as part of our international promotions program which we conduct every year.No tickets were sold. €1,000,000.00 (One Million EURO) in cash credited to file SL/06-GmbH/4009. This is from a total cash prize of €50 Million Euro shared amongst the first fifty (50) lucky winners in this category.This year Lottery Program Jackpot is the largest ever for Sachsen Lotto-GmbH. 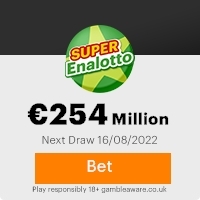 The estimated €50 million jackpot would be the sixth-biggest in Europe history. The biggest was the €363 million jackpot that went to the winners in a Febuary 2000 drawing of The Big Game Mega Millions' predecessor. Your fund is now deposited in an offshore bank with a hardcover insurance.Due to the mix up of some numbers and names, we advice that you keep this award from public notice until your claim has been processed and your money remitted to your nominated bank account as this is part of our security protocol to avoid double claiming or unwarranted taking advantage of this program by the general public. Please note that your lucky winning number falls within our European booklet representative office in London. In view of this, your €1,000,000.00 (One Million Euro) would be released to you by our affiliate bank in Europe. Our agent will immediately commence the process to facilitate the release of your funds to you as soon as you make contact with him. Note that all prize funds must be claimed not later than 3 weeks. After this date all funds will be returned to the LOTTERY TREASURY as unclaimed. In order to avoid unnecessary delays and complications, please endeavor to quote your Reference Number:SL/06-GmbH/4009 and Batch numbers:SL/06-GmbH/3434 in every correspondence with your agent. Furthermore, should there be any change in your address, do inform your claims agent as soon as possible.Members of the affiliate agencies are automatically not allowed to participate in this program. Create the ultimate e-mail address book. Import your contacts to Windows Live Hotmail. Try it! Previous: CONGRATULATIONS....... ... TIONSFresh ScamsNext: CONGRATULATIONS YOU HAVE WON!!! This Email with the Subject "Congratulations! You Have Won A Million Euro(|1,000,000)... ContactYour Claims Agent." was received in one of Scamdex's honeypot email accounts on Thu, 17 May 2007 07:12:19 -0700 and has been classified as a Generic Scam Email. The sender shows as Sachsen Sachsen <sachsen_20015_sachsen@hotmail.com>, although that address was probably spoofed. We recommend that you do not attempt to contact any persons or organizations referenced in this email, as you may expose yourself to scammers and, at the very least, you will be added to their email address lists for spam purposes.